Do you remember having these as a kid? Well, I made them a bit more adult and just a bit richer tasting. Ooooh so tasty. Perfect for this last bit of heat in the summer. Also very good for de-stressing after a bad couple of weeks hehe. Parents are gone, its time to celebrate with a gourmet fudgsicle! Sure you can do these with any chocolate you like but I find dark chocolate to be all the more chocolatey and indulgent…does that make sense? Spray popsicle molds with cooking spray. I melt my dark chocolate in the microwave for 20 seconds or so. Easier than a double boiler anyday. Blend all the ingredients in a blender until smooth and uniform. If you find it is not coming together. Heat the ingredients together in the microwave for 20 seconds and blend again. Pour into popsicle molds. Freeze for atleast 4 hours. Typically makes 4 popsicles, depends on the size of your popsicle mold. Each serving contains 120 calories, 3.6 grams of fat, and 2.2 grams of fibre. Definitely more fibre and less chemicals than your everyday fudgsicle. These are delicious, decadent, and good for you! I keep hearing about how just a bit of dark chocolate acts as an antioxidant, paired with all the vitamins packed in the bananas this is a real winner! 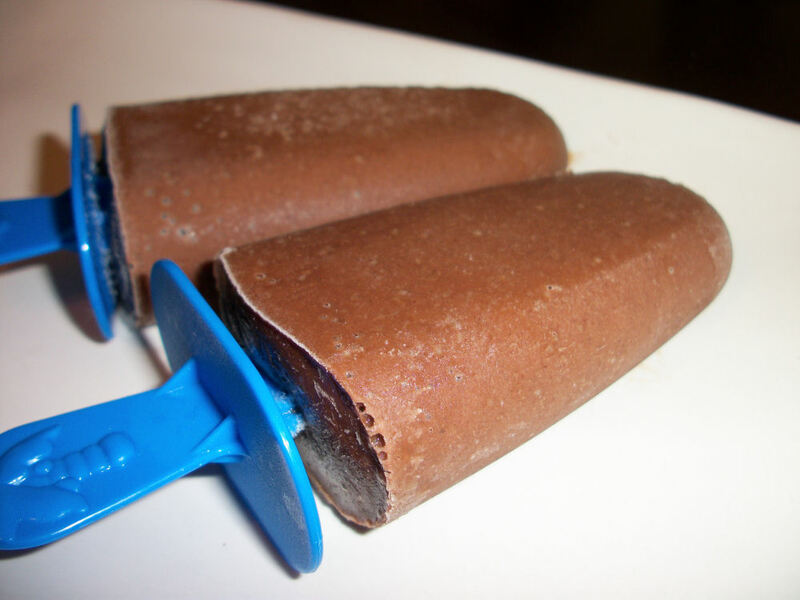 A really fun variation to try is mexican chocolate fudgsicle. If you don’t have access to mexican chocolate you can always fake it by adding spices, refer to my mexican hot chocolate brownies for the mix. So good! Enjoy! This entry was posted in Craving Buster, Dessert, Snack and tagged Banana, chocolate. Bookmark the permalink.